Uneasy access: Golnaz Farmani is detained in Offside. In the cinema of a country such as Iran, cross-dressing -- girls disguising themselves as boys -- is typically a serious matter. In Jafar Panahi's lively and pointed Offside, it remains so. But the latest from one of that country's best filmmakers fashions that premise into something he hasn't tried before: a comedy. 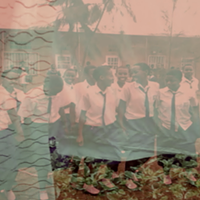 As in, say, Majid Majidi's somber drama Baran (2001), the young women we meet in Offside know that posing as boys will (temporarily) secure them rights they wouldn't otherwise have. In this case, it's not the right to work outside their homes: It's access to a World Cup-qualifying soccer match against Bahrain. 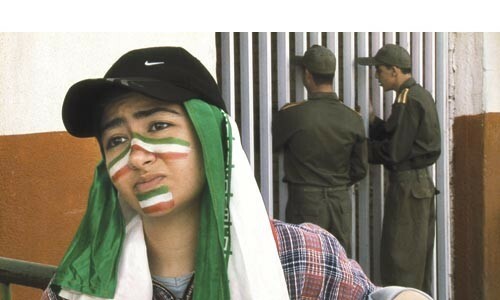 For it remains true, in real-life Tehran as in Offside, that women are legally barred from sports stadia. Part of the comedy in Offside is that the girls fool hardly anyone. The boys on one bus headed to the game identify one such ringer, though they don't care nearly so much as do the soldiers working stadium security, whose pat-downs alarm the girls approaching the gate in unconvincing headwear and suspiciously baggy clothes. The first girl we meet goes on the run until she's caught, then informally penned on a concrete concourse with her fellow non-fellows: other young women nabbed trying to sneak in. Most of Panahi's movie takes place on that one stark expanse of concrete. Offside is a patient, witty comedy that feels like it revolves around its characters, even though we learn hardly any of their names. The soldier who detains one girl borrows her cell phone to call his girlfriend -- who then mistakes the detainee's voice for that of a romantic rival. One detainee is a rangy tomboy with a bemused James Dean scowl; another dons a stolen military uniform, and would have seen the whole game had she not carelessly helped herself to VIP seating. Perhaps challenging our preconceptions about Iranian gender relations, the girls freely question, upbraid and mock the male soldiers. These men, in fact, aren't much older, they're doing mandatory military service, and they'd also rather be somewhere else -- like watching the big game with all the other fans in modish haircuts, blue jeans and Ronaldo jerseys. The soldier who reluctantly escorts one detainee to the bathroom is more Barney Fife than John Wayne. He parrots the conventional wisdom that women are barred from sporting events to protect them from crude male behavior but, like his colleagues, he barely seems to believe this himself. In films including 2000's The Circle -- a probing drama about the repression of women in Iran -- and 2003's Crimson Gold, a stunning crime drama and social critique, the 45-year-old Panahi has taken a neorealistic approach to plot and character. Offside is no exception: Panahi shot it partly guerrilla-style, at a real game, without permission from the same Islamic fundamentalist-dominated government that has yet to allow any of his films to screen commercially in his homeland. Likewise, Panahi directs his nonprofessional cast to performances that for the most emerge as naturally as the social commentary does from the story. The men can't understand why it's so important to the women that they see the game. When a soldier obliges the women with some play-by-play -- based on his own distant view of the field -- one girl chides, "It's not like local radio. We want facts, not promoting your local heroes." Likewise, when the girls organize a re-enactment of a big play, we catch hints of clever allegorical commentary on the plight of filmmakers in a country that, despite all it shares with the rest of the world -- like soccer fanaticism -- is still bullied by mullahs. With its concluding comic procession through a citywide post-game celebration (think "Steelers over Seahawks"), Offside remains an appealingly cheerful and humane essay. But Panahi never lets you forget the stakes. Tellingly, while repeatedly emphasizing the importance of the Iran-Bahrain match, Panahia deposits the film's audience in female soccer fans' shoes by permitting us to see the field of play only once. That glimpse comes over the shoulder of a hapless soldier, seconds after his determined female prisoner has fled his custody -- liberated at last to have the run of the house. In Farsi, with subtitles.